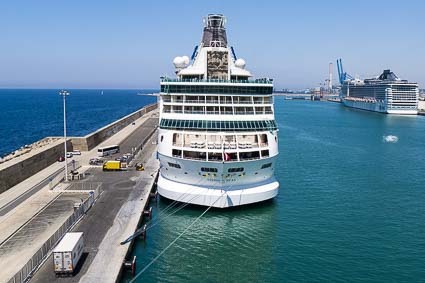 Norwegian Jade arrived in Civitavecchia (the deepwater harbor for Rome) on a Saturday. 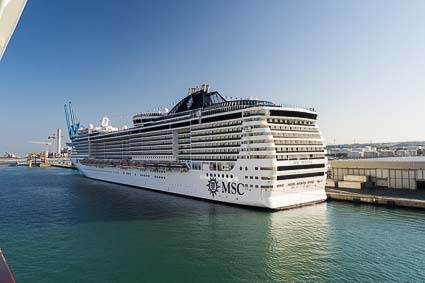 Several other cruise ships, including MSC Divina and Royal Caribbean's Vision of the Seas, were already in port. 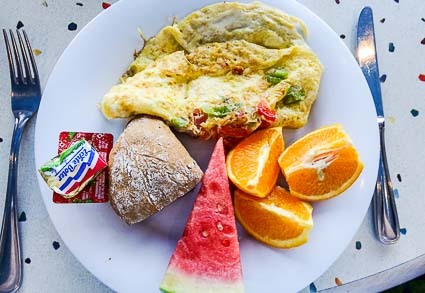 As usual, we had breakfast while our fellow passengerswaited for shuttle buses. 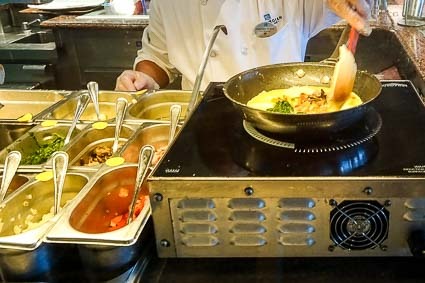 Cheryl had an omelette that was made to order at one of the Garden Café's three omelette stations. 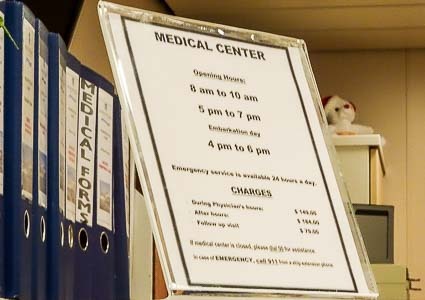 Durant had been troubled by a nagging cough and a growing malaise for more than a week, so he paid a visit to the Medical Center on Deck 4. 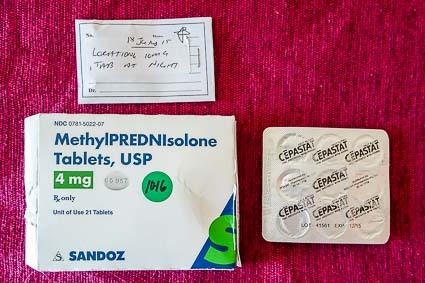 After seeing one of the ship's two doctors, Durant left the Medical Center with an assortment of medications and a receipt for USD 232.65. 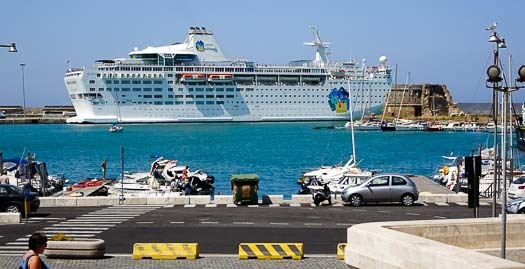 Since he was already familiar with Civitavecchia, he decided to stay on board while Cheryl went ashore. 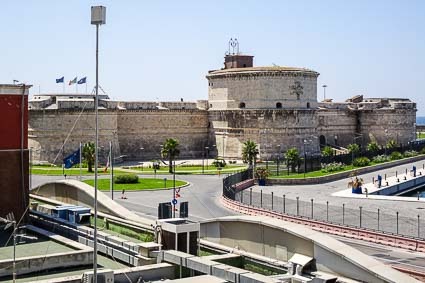 Cheryl took the shuttle bus to a station near one of the port's three entrances, on the north side of the old city walls. 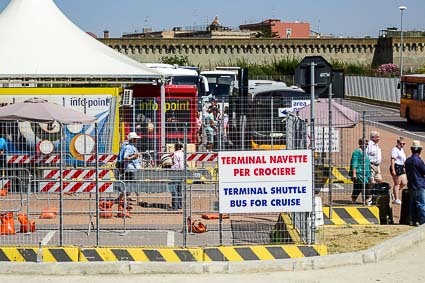 The station was less chaotic than the old stop by the western port entrance that we'd used during past visits:This time, there were dedicated parking spots for buses to each ship. 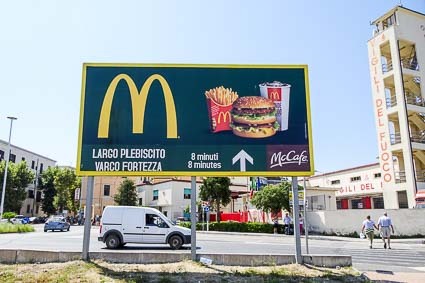 Since Cheryl was staying in Civitavecchia for the day, she oriented herself with a McDonald's billboard that pointed toward the town center. 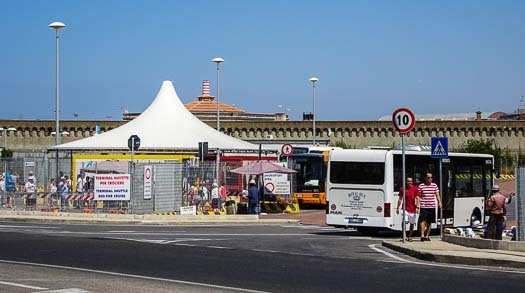 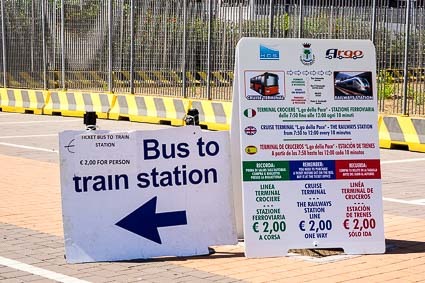 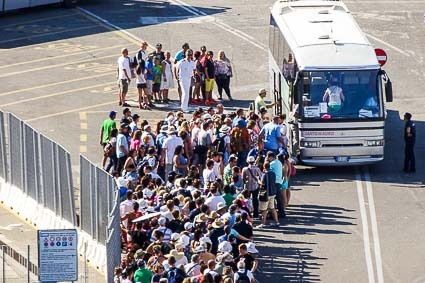 From the shuttle-bus stop, it was an easy walk to downtown Civitavecchia along the walls of the port. 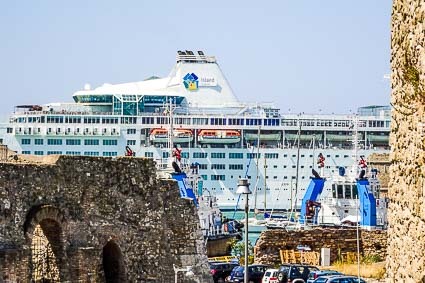 The walk offered good views of cruise ships, ferries, and the port itself. 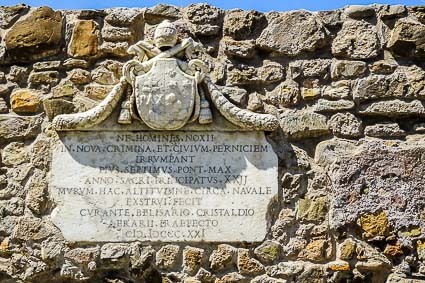 A plaque on the city walls had information in Latin for visiting classics professors, doctors, and priests. 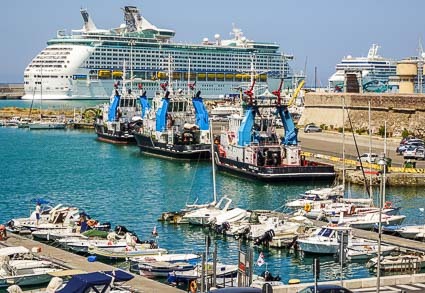 After walking a few blocks along the Via XVI Settembre, Cheryl turned right and detoured through the central port gate toward the water. 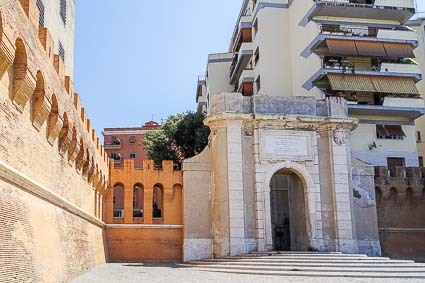 Here, she had views of both the city walls behind her and the harbor. 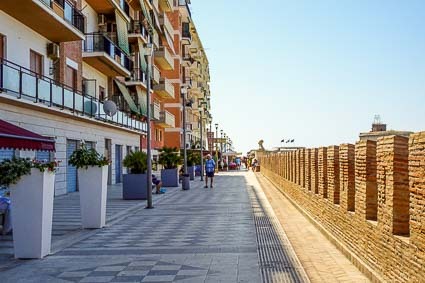 Since the port wasn't especially pedestrian-friendly, Cheryl retreated to the city side of the walls, where she found a promenade that led toward the city center. 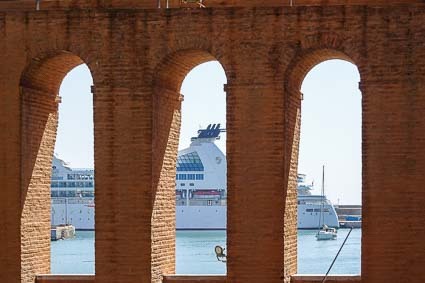 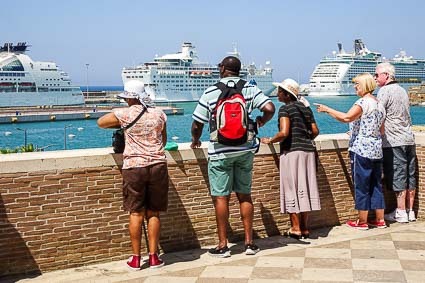 From the elevated walkway, tourists and locals could enjoy views of the harbor (including Forte Michelangelo, Civitavecchia's signature ruin), the boat marina, and visiting cruise ships.